The HEMT or High Electron Mobility Transistor is a type of field effect transistor (FET), that is used to offer a combination of low noise figure and very high levels of performance at microwave frequencies. This is an important device for high speed, high frequency, digital circuits and microwave circuits with low noise applications. These applications include computing, telecommunications, and instrumentation. And the device is also used in RF design, where high performance is required at very high RF frequencies. The key element that is used to construct an HEMT is the specialised PN junction. It is known as a hetero-junction and consists of a junction that uses different materials either side of the junction. Instead of the p-n junction, a metal-semiconductor junction (reverse-biased Schottky barrier) is used, where the simplicity of Schottky barriers allows fabrication to close geometrical tolerances. The most common materials used Aluminium Gallium Arsenide (AlGaAs) and Gallium Arsenide (GaAs). Gallium Arsenide is generally used because it provides a high level of basic electron mobility which has higher mobilities and carrier drift velocities than Si. 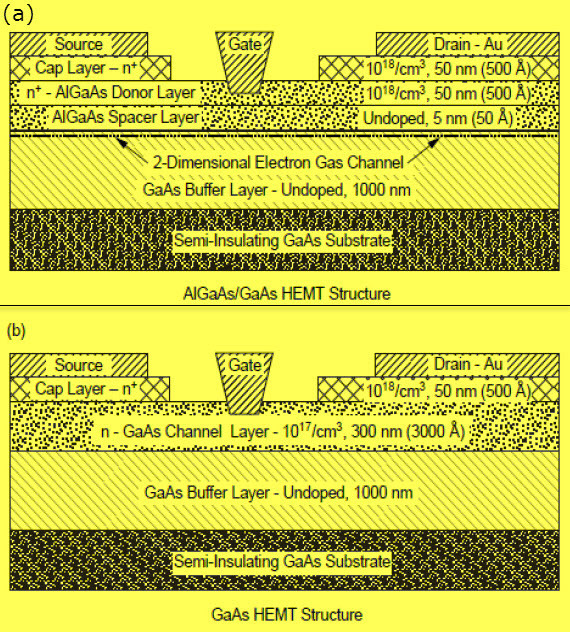 The manufacture of an HEMT as follows procedure, first an intrinsic layer of Gallium Arsenide is set down on the semi-insulating Gallium Arsenide layer. This is only about 1micron thick. After that, a very thin layer between 30 and 60 Angstroms of intrinsic Aluminium Gallium Arsenide is set down on top of this layer. The main purpose of this layer is to ensure the separation of the Hetero-junction interface from the doped Aluminium Gallium Arsenide region. This is very critical if the high electron mobility is to be achieved. The doped layer of Aluminium Gallium Arsenide about 500 Angstroms thick is set down above this as shown in the diagrams below. The exact thickness of this layer is required and special techniques are required for the control of the thickness of this layer. There are two main structures that are the self-aligned ion implanted structure and the recess gate structure. In self-aligned ion implanted structure the Gate, Drain and Source are set down and they are generally metallic contacts, although the source and drain contacts may sometimes be made from germanium. 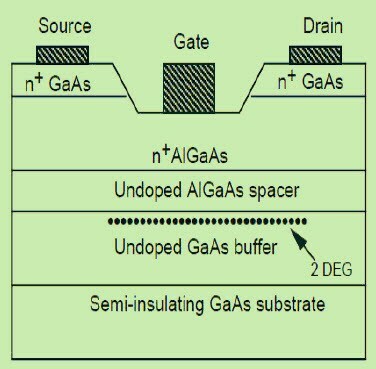 The gate is generally made of titanium, and it forms a minute reverse biased junction similar to that of the GaAs-FET. For the recess gate structure, another layer of n-type Gallium Arsenide is set down to enable the drain and source contacts to be made. Areas are etched as shown in the diagram below. The thickness under the gate is also very critical since the threshold voltage of the FET is determined by the thickness only. The size of the gate, and hence the channel is very small. To maintain a high-frequency performance the size of the gate should be typically 0.25 microns or less. The operation of the HEMT is a bit different to other types of FET and as a result, it is able to give a very much enhanced performance over the standard junction or MOS FETs, and in particular in microwave RF applications. The electrons from the n-type region move through the crystal lattice and many remain close to the Hetero-junction. These electrons in a layer that is only one layer thick, forming as a two-dimensional electron gas shown in the above figure (a). Within this region, the electrons are able to move freely, because there are no other donor electrons or other items with which electrons will collide and the mobility of the electrons in the gas is very high. The bias voltage applied to the gate formed as a Schottky barrier diode is used to modulate the number of electrons in the channel formed from the 2 D electron gas and consecutively this controls the conductivity of the device. The width of the channel can be changed by the gate bias voltage. The HEMT was formerly developed for high-speed applications. Because of their low noise performance, they are widely used in small signal amplifiers, power amplifiers, oscillators and mixers operating at frequencies up to 60 GHz. HEMT devices are used in a wide range of RF design applications including cellular telecommunications, Direct broadcast receivers – DBS, radio astronomy, RADAR (Radio Detection and Ranging System) and majorly used in any RF design application that requires both low noise performance and very high-frequency operations. A further development of the HEMT is PHEMT (Pseudomorphic High Electron Mobility Transistor). The PHEMTs are extensively used in wireless communications and LNA (Low Noise Amplifier) applications. They offer high power added efficiencies and excellent low noise figures and performance. Thus, this is all about High Electron Mobility Transistor (HEMT) construction, its operation and applications. If you have any queries on this topic or on the electrical and electronic projects leave the comments below.